Almost everyone plays computer games, and most of us have wondered at one time or another: "What sort of a mind does it take to create one of these things?" We wondered, too, so we had a talk with three designers from Activision, a company which has had phenomenal success manufacturing and marketing games for the Atari Video Computer System. 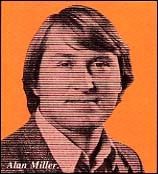 Alan Miller, a senior designer, programmed Checkers, Tennis and Ice Hockey for Activision. We asked him to tell us about getting started--where does the idea for a game come from? "Occasionally you have a brilliant thought--one that brings you right to the theme of the game. It is perfect; you can follow that thought and that theme all the way and implement it on the game system almost immediately." How often does that happen? "Very rarely. Usually what happens is that you get stuck. You have just finished your last cartridge and you're thinking 'What am I going to do next'"
"You think for a couple of weeks and you come up with some ideas that you hope will work. Then you have to consider the technical limitations of the machine. Some of your great ideas simply can't be done. That probably eliminates about 90% of the ideas we have. "But after a week or two you find an idea you are happy with and you begin to pursue it. That's when the real work starts." We asked Alan for some specifics. How, for example, did he go about programming the Tennis cartridge? "Well, one of the best cartridges I did while working at Atari was Basketball. I particularly enjoyed working on the perspective aspect of the game design. I also enjoy playing tennis very much, so I put the two ideas together and decided to do Tennis. "I knew basically what I wanted to do with the game when I started. It took about two weeks of intense work to create a display that would do what I wanted with the limited capabilities of the VCS.
" I then spent ten or twelve weeks working on the playability and polishing the game. That part of the design process is essentially an editing function--you expand on the good features and eliminate the bad ones." One of the features in Tennis upon which players frequently remark is the shadow of the ball on the court. We asked Alan at what point he decided to add it. The shadow, he said, was part of the original game concept for Tennis. "After Basketball was released, I got feedback from many people who said that they could not follow the motion of the ball as well as they wanted to. It occurred to me that adding the shadow would help make the perception of the perspective better. "So, it was there from the beginning. It turns out to be a very trivial task to add it on the VCS. The critical thing is deciding whether or not to do it; you must realize that it is necessary." We commented on the apparent high resolution of Tennis and several of the other Activision games, and wondered how it was achieved. Alan responded, "We have learned no new secrets about the Atari VCS; we are using the same technical information that we have been using for the past four or five years. I think our success in getting the most out of the machine is attributable mainly to experience and hard work." What about program size? Do they use more memory in the current cartridges than they did in the earlier ones? "In general, yes. Our programs in the early days were only 2K programs. We have recently gone to the 4K size because the expectations for video games have risen dramatically over the past year or two. "Tennis is still in 2K--I did a lot of scrunching. I compressed my code, optimized it for space, and was able to put in five running graphics for the players and several different pictures of a swinging racket. This was in contrast to only two pictures of running graphics in Basketball. " 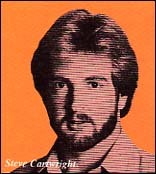 Steve Cartwright, author of Barnstorming, went to school with David Crane, one of the original Activision designers. Later, he worked for National Semi-Conductor. "When Activision decided to expand their design staff, Dave thought of me. He thought I would fit into the group, that my personality would be similar to the other people in the group. I had the technical background, and he taught me some of the secrets of game design." Was his work at National Semi-Conductor helpful in preparing him for his new job? "I worked on semi-conductors--nothing in software. I had a little software back in college, but nothing can prepare you for game design other than sitting down and doing it." We asked him what the other designers had taught him--what sort of a learning process he had to go through. "Basically," he said, "these guys have been at it longer than anyone in the industry. They were among the original designers at Atari and they just have more experience to draw upon. "They tried to teach me everything they had learned over the years, and spent some time comparing what was considered good a couple years ago with the current standards. The standards have improved a great deal because of little tricks they have learned to make the colors seem nicer, the graphics sharper, etc. All of the programs on the VCS cartridges are, of course, written in machine language. How is writing a program for a game unit different from writing a machine language program for an Apple, PET, TRS-80 or other small computer, we asked. Steve explained, "Since the Apple, PET and Atari VCS all use a 6502 processor, we're talking about the same assembly language. What we do with the VCS is to control on a very low level the video display hardware. The main difficulty we have with VCS programming is that it is very time-critical--you must execute commands to the display hardware on a microsecond basis. "We try to put as much as we can into the program to provide as much as possible to the customer at as low a cost as possible. We scrunch a lot into our code--something you don't have to do on other systems." Barnstorming is different from any of the arcade games. We asked Steve how the idea for the game developed. "The idea came to me in about two seconds, but it took three months to translate that idea into a playable game. "We are constantly coming up with and rejecting ideas," he said. "We find ourselves imagining everything we see around us as a video game." It just happened that it was possible to translate the idea of barnstorming into a game." 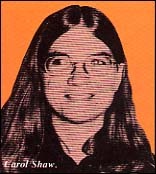 Carol Shaw, the newest member of the design team, is a Phi Beta Kappa with a master's degree in computer science. We asked her how she became involved with video games. "My family always played lots of games," she told us. "We started with board games, and when the video games came out, we started playing them and fell in love with them." Following her graduate work, she went to work for Atari because "it just seemed like a great job--playing games for a living. " Among the games she has programmed are Checkers and 3-D Tic, Tac, Toe. We asked how programming simulations of classic games differs from designing the action games for which Activision is famous. "I have always been interested in making the computer intelligent, because that is something that you cannot get from a board game. You can actually have an intelligent opponent to play against. But it is not that different from Tennis, for example. In both cases you must concentrate on graphics and action as well as making the computer intelligent." Carol told us that some of the routines used in the Checkers program she wrote for Atari were based on work done by Arthur Samuels in the 1950s. She explained that "the basic algorithm, which is called Alpha-Beta pruning, hasn't changed in all those years. The major improvements since then have been the result of faster processors rather than more intelligent algorithms." What advice do these Activision game designers have for readers who are frustrated with their jobs and would like to be designing games instead? Alan advises becoming proficient in assembly language programming and asking friends for feedback on game ideas. "Our creative efforts are strongly influenced by the comments we get from our coworkers, friends and families; they give us good ideas. You must realize that you, as an individual, might not recognize the best things that can come out of your own game. And you may have to make compromises, because other people may view your game differently than you do." It also helps to live in Silicon Valley, where you can talk to people who have been involved in this business for five or ten years. It helps to have all the ideas going back and forth. "The financial climate in and around the Valley is also more receptive to the formation of new companies. There is a sort of entrepreneurial spirit there; people are willing to take a risk and start a new company." Is the design team interested in experimenting with games other than the action-type which has dominated their product line to date? What about fantasy or adventure games? Alan replied, "Yes, but there are many technical limitations -adventure games are just plain hard to do on that system. The graphic display system is very simple and not set up for text." Is it the hardware limitation of the processor or the amount of memory that can be built in? "The technical limitations to which I am referring are primarily in the display. I don't think memory size will be a limitation in future programs." Do the programmers anticipate developing software for the new Atari System 5200? "In the future," Alan replied, "Activision will supply entertainment software for any successful video game or personal computer. Only time will tell if the new Atari game will be a commercial success." How do they feel about recent attempts to implement popular arcade games on the VCS? "Atari, Coleco, Parker Brothers and several other companies have bought rights to some of the coin-operated arcade games. But you must remember that with a coin-op game you have between $1000 and $2000 worth of hardware to work with; you have a specialized screen and a specialized controller for each one. There is no way they can afford to put those sophisticated hardware controls in a home system; it is extremely difficult to duplicate the play value of an arcade game in a home game."